The celebrations for Rosh Hashanah, or Jewish New Year, begin tonight. This year we’ll miss having dinner with my family and the in-laws, ringing in the new year together (yes, both sides of the family celebrate together – how cute is that?). Instead we’ll be in Israel, enjoying a small potluck feast with our friends, who become the closest thing to family in a foreign place. I developed this recipe for parve Applesauce Cake with Pomegranate Glaze for the Jew and the Carrot this year and loved it so much that I’m making it again to bring to Rosh Hashanah dinner. Please check out the original article (full of fun facts and information) on the Jew and the Carrot! Although honey cake might be the most traditional dessert for the holiday, I know a good many families who turn to apple cake year after year. The thing is, I’ve had terrible luck with making apple cake in Israel. You already know that I have issues with my oven. Well, every time I’ve tried to make a traditional apple cake it just won’t cook. The top appears golden, a toothpick comes out clean, I’m convinced I’m in the clear – and then. Then I go to flip the cooled cake and it turns out the bottom is total mush. I tried again last week – this time with pomegranate seeds mixed in – and was met with a double failure. Not only did the cake not cook properly, but the pomegranate seeds became crispy and totally unappealing inside. Even my husband wouldn’t touch it. So my decision to make an applesauce cake really came from a practical place. Something about those pieces of apples was not working in my baked goods. I knew I wanted to incorporate date honey as a nod to honey cake, and my love of date honey, so added some of that. And, since pomegranates are another symbol of the new year and one of my favorite fruits I wanted to include them but already knew that simply putting seeds in the cake was not going to work. So instead I made a glaze studded with pomegranate seeds. An apple-honey-pomegranate cake! If that doesn’t symbolize a sweet new year, I don’t know what does! This cake came out good. I mean perfect good. With just a hint of spice and a lot of apple flavor, the texture was moist, tender, and springy. It was so moist that I left it on my kitchen counter uncovered for three days and it didn’t show even the slightest signs of drying out. (Three days, by the way, is the amount of time it took two of us to consume this entire cake.) The cake, which is not overly sweet, doesn’t even need the pomegranate glaze. But it’s worth it. Besides looking pretty, the glaze adds a touch of complexity, a sweet-tart element that leaves you licking the plate. It’s good. And, if you don’t celebrate Rosh Hashanah, this cake is still just perfect for fall. It’s as good for breakfast as it is for dessert, and is bound to show up on my table throughout the year. This moist, delicious applesauce cake is foolproof and just as good for breakfast as dessert. The pomegranate glaze, while not necessary, adds something special. In a small mixing bowl sift together the flour, baking soda, baking powder, salt, cinnamon, and nutmeg or cloves. Set aside. In a separate large mixing bowl stir together the brown sugar, vanilla extract, and vegetable oil until thoroughly combined. Stir in the date honey, then whisk in the eggs one at a time. Add the apple sauce and stir until fully mixed in. Add the flour mixture one third at a time, making sure it is well incorporated before each addition. Spoon the batter into a greased 10-inch Bundt or tube pan. Transfer to the preheated oven and bake 40 to 60 minutes, until a toothpick comes out clean. Allow to cool slightly then invert onto a plate or board. Let it cool while you make the pomegranate glaze. Combine the pomegranate juice, sugar, and lemon juice in a small pot over medium heat. Bring to a boil then reduce to a simmer. Simmer, uncovered and stirring frequently, until syrupy and reduced by about half (about 15 minutes). Remove from the heat and stir in the pomegranate seeds. Spoon the glaze over the cake and serve. Blog Birthday and My First Giveaway! I don’t celebrate Rosh Hannah but I want to make this cake anyway…it’s absolutely beautiful with those little jewel-like pomegranates on top. Wonderful! This is so beautiful! Funny how from failure beauty can emerge. Happy, happy new year! Thank you Lori! So well put. Happy new year to you as well!! My goodness, this looks incredibly delish. I’m drooling here. Slurp. Thanks for the recipe & have a great day. What a beautiful cake. I wish I could find a pomegranate to make it. It seems the season hasn’t quite started and there are none to have. Enjoy that beautiful cake and Happy New Year.! Thank you Judee! I am so lucky that a gorgeous pomegranate season is just beginning in Israel. But, the cake is really good on its own and doesn’t *need* the glaze, or you could make it just with pomegranate juice and no seeds. Not quite the same effect but still tasty! I bet you cuold create an awesome gluten free version. Happy new year to you too! What a gorgeous cake, and the pomegranate glaze is inspired! I just made an applesauce cake for tomorrow and will glaze it with your recipe here. Thank you Hannah! That’s perfect timing! I hope you enjoy the glaze, let me know how it comes out! Your glaze was a hit! It added such a lovely, tart flavor to the applesauce cake, plus the cake looked so pretty with the pomegranate seeds on top. Thank you for sharing! I am so happy to hear that! Makes my day 😀 Thanks for stopping back to let me know how it went. Applesauce cake is a great fall cake and yours does look delicious. 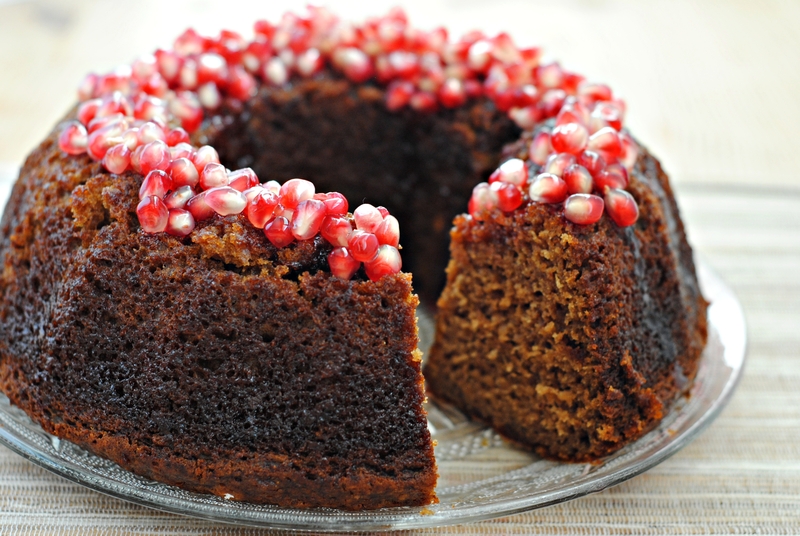 Usually bundt cakes do not require topping, but yours is a wonderful addition since I love pomegranate. You have added a little extra flavor and a big bonus for the presentation. Well done! Yes, this is definitely perfect for fall! And it doesn’t need the pomegranate glaze, that was just me going over the top! 🙂 Thanks Tina! Your cake looks absolutely beautiful! I made a Finnish type apple based cake this year for my cousin’s New Year dinner. Happy Rosh Hashana to you too Yael! Thank you so much 🙂 I bet your Finnish apple cake was delicious! This is such a cute way to decorate a cake without any frosting. Happy Rosh Hashana.. this is a gorgeous looking cake. Thank you! Yes, it is a good alternative to traditional frosting. Happy Rosh Hashanah to you too and thanks for stopping by! This is so amazing. Just love this. What a beautiful cake! I love the combination of the simple apple with the exotic pomegranates. Thank you! It’s a great combination. happy new year from tel aviv. Shana Tova! Your Pomegranate Apple cake is stunning! Wow, what a beautiful cake, and I love the pomegranate glaze. This is definitely being added to my Rosh Hashanah menu. L’Shana Tova! Thanks so much! I hope you like it as much as I did 🙂 L’Shana Tova! I’m so glad your oven cooperated this time! What a gorgeous cake…love the pomegranate topping~ Happy New Year! That’s a beautiful cake! The pomegranate arils are like jewels adorning the cake. Happy New year! I would love to celebrate a Jewish holiday…with all their trademark foods…would be so meaningful and fun! Happy Rosh Hashanah! What a beautiful cake Katherine! The red pomegranate is shining like jewels! I love this! Thank you Nami! Such a nice compliment. Happy Rosh Hashanah! This was SO good. Moist and delicious. I loved the pomegranate topping, totally made the whole cake! I am so glad you enjoyed it! Your cheesecake was out of this world. Yay pomegranate toppings!! Katherine, this cake looks magnificent! I love the pomegranate on top of it, and the color combination! This sounds amazing, and looks gorgeous. L’shana tova! Thanks so much for linking up this week and I’ll be featuring this recipe this weekend. Congratulations! We wanted to inform you that this post has been selected as a featured Archive Post during the month of November. Katherine, The recipe is marvelous.